According to famous Turkish newspaper Daily Sabah huge projects including Istanbul’s third airport , Yavuz Sultan Selim Bridge and North Marmara Highway have ackowledged residence developments near these projects to increase in value. The worth of land and residential properties in Eyüp, Çatalca, Arnavutköy, Sarıyer, Beykoz and Çekmeköy have increased nearly four times, the raise in the quality of housing in regions like Sancaktepe are drawing increasing interest. The regions seeing the highest rise in value of real estate are Arnavutköy Karaburun, Beykoz Riva, Sarıyer Uskumruköy and Çekmeköy Nişantepe thanks to construction of the third bridge, Maya said that real estate prices reportedly increased four times in those districts. Maya said that amongst housing developments situated on the North Marmara Highway route and near to its access roads, namely the Sancaktepe region, has seen additional interest and is undergoing urban transformation with new housing projects. In Consideration of the number of projects currently in the planning stage that are under construction, Maya said that 4,000 new residence housing projects will be provided to the area of Sancaktepe by 2018, followed by Çekmeköy with almost 930 projects. Maya stated , the districts of Zekeriyaköy and Uskumruköy in Sarıyer are dominant areas near the North Marmara Highway with 300 new housing projects. “It is a fact that there will not be any areas left for new construction around the bridge, therefore we see that the new projects in these areas are now under construction especially close to the bridge’s exit and access roads , with real estate property developers taking major steps towards new projects in these areas,” . Maya said the housing prices in Göktürk, Zekeriyaköy, Başakşehir, Çekmeköy, Sancaktepe and Beykoz districts have increased in value due to the construction of the third bridge but this rise is not as high as the price of land there. These type of huge projects lead to increases in value in two different stages, Maya said according . The first stage occurs during the construction period directly following the announcement of the project and the second stage occurs during the project’s revival after its completion. In a statement last week , Transportation, Maritime and Communications Minister Ahmet Arslan said that the establishment of new construction areas on the third bridge’s route was out of the question. Constructed as part of the North Marmara Highway project, Yavuz Sultan Selim Bridge is located on a 148-kilometer section of the Odayeri- Paşaköy area. Construction of the bridge started on May 29, 2013 and is the world’s widest suspension bridge. This work of art was opened on Friday, Aug. 26 with the attendance of President Recep Tayyip Erdoğan, Parliament Speaker İsmail Kahraman, Prime Minister Binali Yıldırım and leaders of different countries. 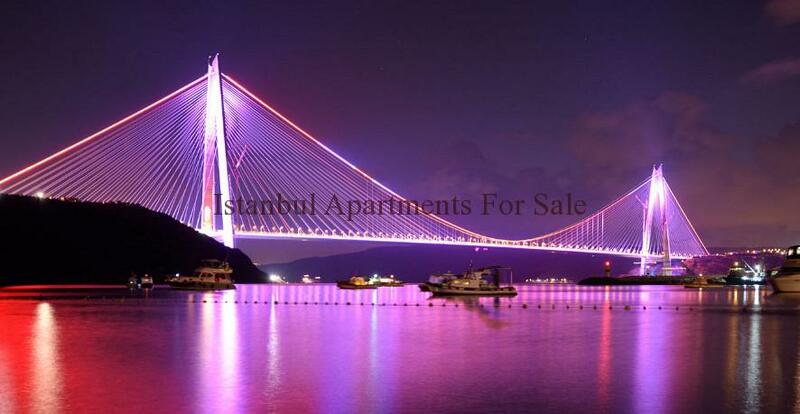 huge projects including Istanbul’s third airport , Yavuz Sultan Selim Bridge and North Marmara Highway have ackowledged residence developments near these projects to increase in value.